← Code Like a Pirate: Arrr! Many Americans are familiar with the situation in many Muslim dominated countries: the religious right media machines have been drawing attention to this for more than a decade. In Saudi Arabia, for example, there are nationally televised whippings of people convicted of insulting Islam almost every week. The laws being invoked are quite broad, and actual offenses have included everything from speculating what Muhammad might do if alive today to publicly engaging in non-Muslim worship to writing blogs that question the Saudi theocracy. Apostasy from Islam generally ends up with the convicted person facing beheading or a firing squad. Even being the wrong type of Muslim is a criminal act, and the Saudi government has been condemned by international rights organizations for whipping, even killing, Muslims who do not adhere to the strictures of Saudi Arabia’s state religion, Wahhabism. Similar laws exist in every country that has adopted Sharia law in whole or in part: Iran, Iraq, Egypt, Afghanistan, Syria, Jordan, Pakistan, Kuwait, Qatar and others. Blasphemy laws are not limited to Muslim countries. While India does not have an explicit law against blasphemy, the national legal code holds that insults to religious sentiment or belief is hate speech and punishable by up to three years in prison and/or a fine (Indian Penal Code, §295A). Similar laws against hate speech in Canada and South Africa have been invoked successfully as anti-blasphemy laws. Israel has two laws against blasphemy: Article 170 of the penal code makes “insult to religion” a criminal offense punishable by up to three years in prison, while Article 173 criminalizes “injury to religious sentiment” punishable by up to one year in prison. That second law is worded very broadly and can be violated by “crudely offend[ing] the religious faith or sentiment of others” and by “voic[ing] in a public place and in the hearing of another person any word or sound that is liable to crudely offend the religious faith or sentiment of others.” These laws get invoked often: one recent example that received international attention occurred in 2011, when a group of women were arrested and convicted of violating Article 173 just for praying at the Wailing Wall. This image prompted legal prosecution for desecration in Bedford County, Pennsylvania, in September 2014. Explicit blasphemy laws are quite common in Christian countries. In Greece, anyone who publicly blasphemes God faces two years in prison, while mere “lack of respect for the divinity” can be put in prison for three months (Greek Penal Code, Article 198.) This law seems to apply only to the Greek Orthodox Church, as the courts have never allowed them to be used by other Christians, Jews, Muslims or Hindus. This is because the Greek Orthodox Church is the official state religion of Greece: in Article 199, the penal code makes speaking against that church punishable by up to two years in prison. Christians — but not non-Christians — can invoke a law protecting them from “religious insult.” Malta has a similar law (Article 163 of the criminal code) favoring the Roman Catholic Church, and it gets used a lot: in 2012, 99 people (out of a population of about 423,000) were convicted of public blasphemy. Blasphemy laws remain on the books in the United Kingdom, Switzerland, Spain, the Russian Federation, Norway, Iceland, Germany, Austria, Poland and Denmark. Even in the United States, blasphemy laws exist. Six states — Massachusetts, Michigan, Oklahoma, South Carolina, Wyoming, and Pennsylvania — still have state laws making blasphemy a criminal offense. Those laws are still being enforced: right now in Bedford County, Pennsylvania, a 14 year old boy is being prosecuted for desecration after he posted a silly picture involving him and a statute of Jesus kneeling in prayer (picture above.) Worse, the owner of the statue is not the one pressing charges: prosecution is being pursued as a criminal matter by county law enforcement. The law had previously been invoked in 2010, when a drunken college student took a leak behind a Nativity scene in Wilkes-Barre. An image of the September 30, 2005 page from Jyllands-Posten. It was actually the blasphemy law in Denmark that prompted Blasphemy Day. On September 30, 2005, a major Danish newspaper, Jyllands-Posten, published an editorial on the issue of journalistic self-censorship, when news outlets refuse to carry important stories out of fear that someone might be offended. To illustrate their point, they included 12 cartoons depicting Muhammad. The immediate response was that newsstands refused outright to display or sell that issue. The cartoons associated with the editorial attracted the ire of Danish Muslims, as Islam holds that any depiction of Muhammad is idolatry and thus a very serious crime. Outrage spread through the Muslim world, with diplomats from Saudi Arabia, Turkey, Pakistan, and other Muslim majority nations demanding that the Danish government punish the newspaper for its publishing the cartoons. In late October, 2005, a group of Muslims in Denmark filed a lawsuit claiming that the paper had violated the Danish Criminal Code, sections 140 and 266b, which outlawed blasphemy. The charges were dismissed on January 6, 2006 as having no merit. Dissatisfied with the course of law in Denmark, Danish imams then began an international tour of Muslim countries, posing the failed lawsuit as a deliberate insult to Islam. Their speeches stirred up Islamic hatred against Denmark in particular, and the western world in general: the Danish and Austrian embassies in Lebanon and the Danish and Norwegian embassies in Syria were severely damaged because of mobs angry that Danish law did not give a special place to Islam; Christian churches, communities and individuals were attacked by Muslim mobs using the cartoons as justification; Muslim leaders in Iran, India, Egypt and Libya issued edicts calling for the murder of the cartoonists. 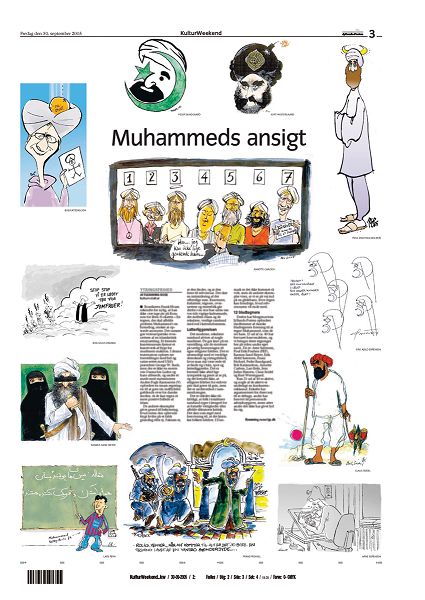 All of which served to illustrate the whole reason why Jyllands-Posten printed the cartoons in the first place: when we give special accommodation to religion, and remain so terrified of offending religious sentiment that we strip ourselves and others of the right to free speech, we cannot claim to value freedom. This is why Blasphemy Rights Day International is so important. If we truly believe in the marketplace of ideas, if we truly value the right to freedom of speech and freedom of the press, we must be allowed to treat religion no differently than we would treat any other topic. As long as free speech remains criminalized, we are not truly free. This entry was posted in General and tagged blasphemy, free speech. Bookmark the permalink.